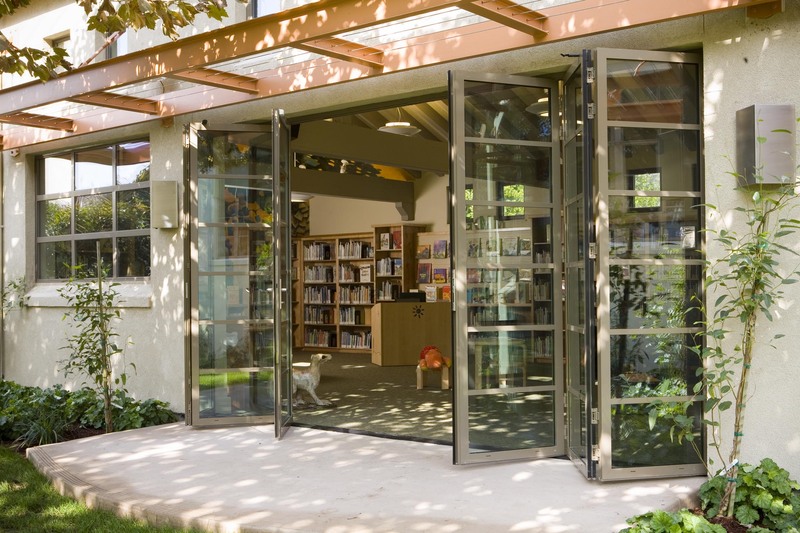 America's oldest freestanding children's library stands nestled on a quiet street in Palo Alto. Noted local California architects Birge and David Clark designed this Spanish Colonial Revival gem, which was built in 1939 and includes a hand-molded Mission style roof, child-sized furnishings, an exquisite fireplace tiled with iconic fairytale scenes and a historic garden. Following a recent renovation, the classic structure also has a handsome NanaWall installation that complements its historic milieu. 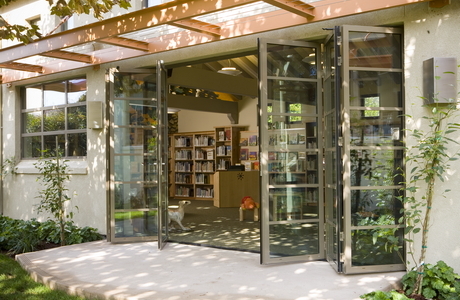 San Francisco-based Architectural Resources Group (ARG) completed the $4.1 million update in 2007, closing off the garden with a side addition. In order to maintain the appeal of the existing garden, ARG specified a NanaWall enclosure with six panels of SL45 Aluminum Framed Folding System. 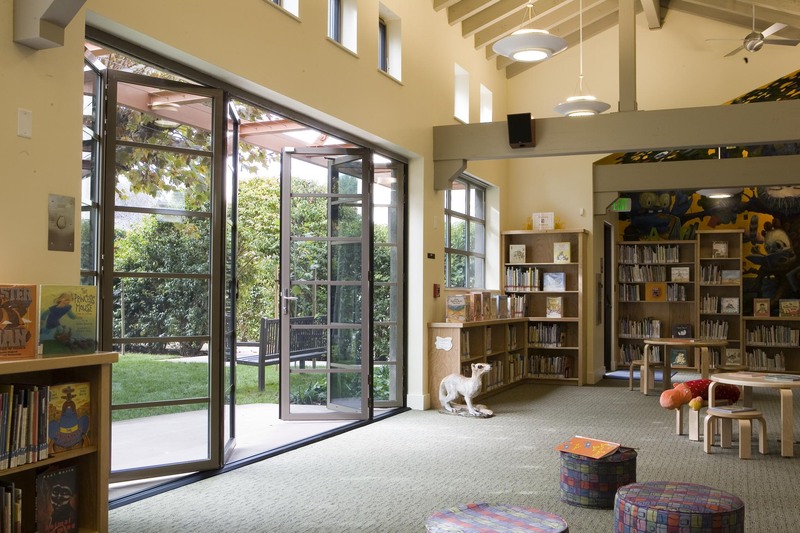 The system opens up to a magical “Secret Garden” courtyard in the library from the multipurpose room, which was designed and added in ARG’s thoughtful scheme. Francis Burnett’s famous 1910 children’s novel – The Secret Garden – was, in fact, the inspiration for this brick-walled retreat. 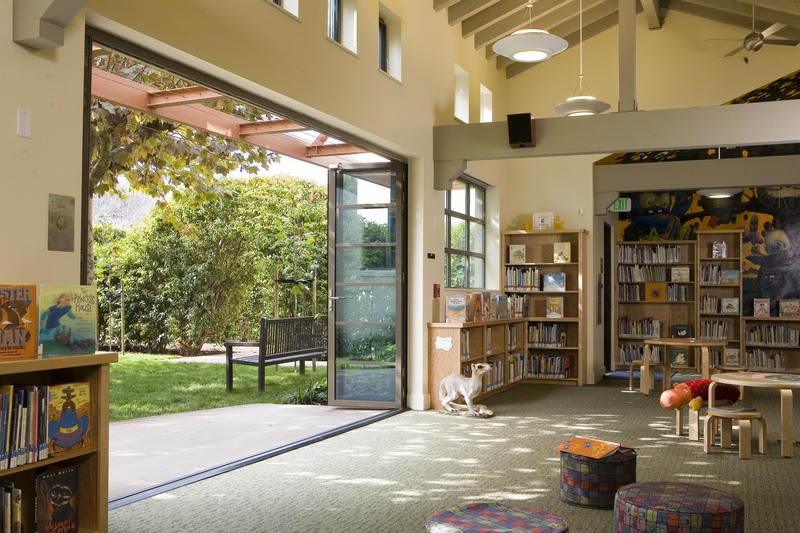 “The NanaWall in the addition to the 1939 Palo Alto Children’s Library opens the modestly scaled program room onto the library’s historic Secret Garden,” states ARG's Cathleen Malmstrom, AIA. 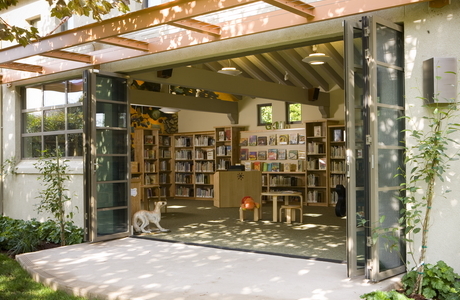 Malmstrom adds that the ability to be indoors and outdoors is a great benefit to the users of the library, attracting many school groups, children and families throughout the year. 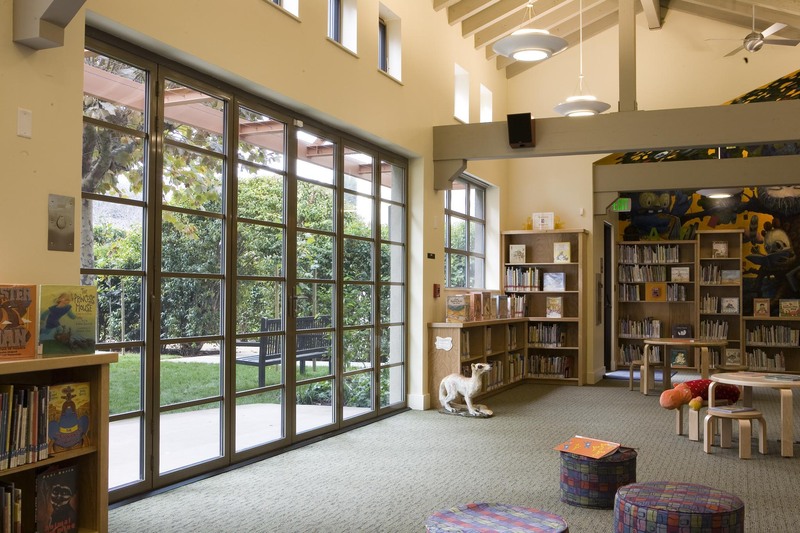 “The NanaWall system enables the library to take advantage of a fine climate much of the year, and helps accommodate groups of 100 or more children for its very popular story hours,” says the architect Malmstrom. The library has always been a vibrant learning and entertainment center for Palo Alto children, which was further increased once Architecture Resources Group added the nearly 2,500-square-foot collections and programming room. 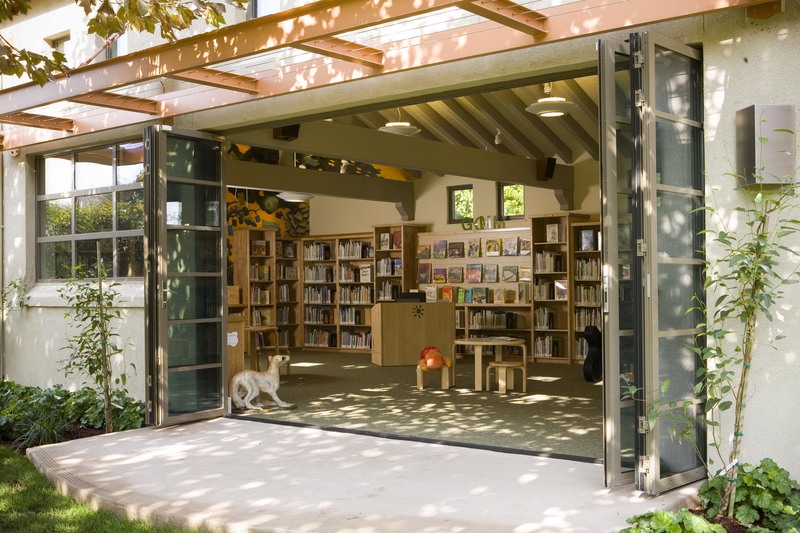 The multipurpose room is aptly named the “Tree Top Room,” because the garden contains marvelous sycamores, pruned so that each top joins together in a canopy. Undeniably, the opening of the NanaWall allows the fantasy scenes on the fireplace and walls and to dramatically synchronize with the garden. One challenge with the renovation was that the Tree Top Room has southern exposure. Malmstrom incorporated NanaWall into the solution. “Low-E glass, combined with an overhead vine-covered trellis, helps mitigate solar gain and strong light associated with the south-facing orientation, which is dictated by the very limited site,” she explains. The low-E glass used in the NanaWall installation allows a fair amount of natural daylight to stream in – visible light transmission, or VLT – while still reducing glare and unwanted heat. This was not Malmstrom’s only attraction to NanaWall. She had utilized a NanaWall system in a previous project in Massachusetts, and was familiar with the product's outstanding engineering and aesthetic applications. 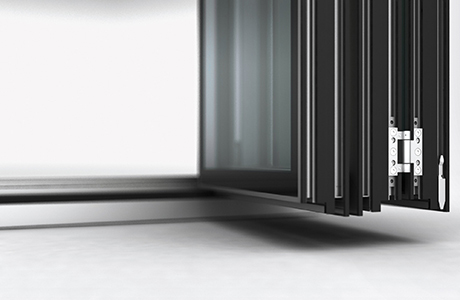 NanaWall's wide selection of finishes also helped meet aesthetic goals for the renovation. 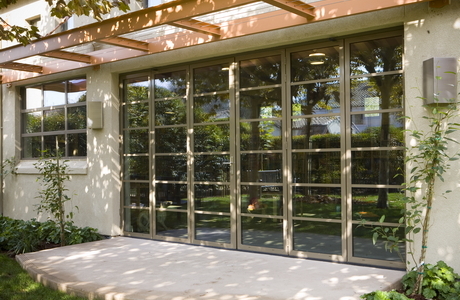 In this case, Malmstrom specified bronze-colored horizontal mullions for the SL45 panels, to match the two fixed windows that flank either side of the doors and to complement the pre-existing fenestration. Moreover, NanaWall's excellent sound attenuation acoustically separates garden functions from activities in The Tree Top Room.